From 2012 Japanese military sci-fi anime television series Space Battleship Yamato 2199, this is Space Battleship Yamato 2199 : Akira Rei Yamamoto Pilot Suit Version PVC Figure. As the second edition Yamato Girls Collection, and of three-dimensional pilot suit Ver. Cosmo Falcon troops belong only female of Yamato Air Corps, Rei Yamamoto. Helmet attached which is indispensable in the pilot reproduced in clear plastic shield part. In addition, by replacing the left arm, flight jacket specifications that can be assume a pose that is the burden of the shoulder. In Space Battleship Yamato 2199, Akira Yamamoto (山本明 Yamamoto Akira) commonly called “Rei” by her friends, is a fighter pilot who serves aboard the United Nations Cosmo Navy battleship Yamato in 2199. Soon after joining the Yamato fighter squadron, Yamamoto distinguishes herself as the ship’s most capable combat flyer. Yamamoto was born in Arcadia City on Mars, the granddaughter of a woman born on the red planet. Like many who were natives of Mars, natural conditions turned Yamamoto’s eyes red. Yamamoto and her family were forced to evacuate soon after the Second Inner Planet War and settle on Earth. In her teen years, she and her older brother Akio Yamamoto became friends with Akio’s fellow fighter pilot, Saburo Kato. After Akio’s death in battle with Gamilas forces and the loss of her remaining family members in the planet bombing of Earth, she accepted Kato’s new role as an older brother figure in her life (“We’re Off Into the Sea of Stars”, “Bid Farewell to the Heliosphere”). Yamamoto conducts her work and her personal affairs with obvious passion. That passion can easily turn into ferocity, both in battle against her enemies and in her personal interactions. Nevertheless, Yamamoto maintains a military professionalism that she calls upon in emotionally charged situations. Friction at the start of the mission to Iscandar does not harm her relationship with Kato, and she consistently remains close to him. Once the two begin fighting side by side, the sibling-like relationship develops into one between equals. Yamamoto remains emotionally attached to her original home on Mars years after the planet is abandoned. 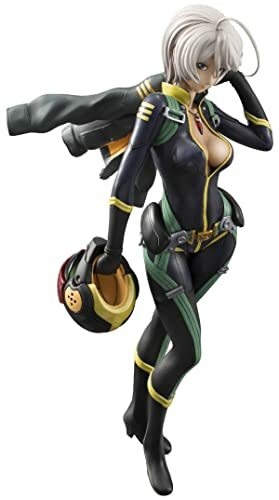 For fans of Space Battleship Yamato 2199, don’t miss this Yamato Girls Collection Space Battleship Yamato 2199 : Akira Rei Yamamoto Pilot Suit Version PVC Figure. See details about this action figure.